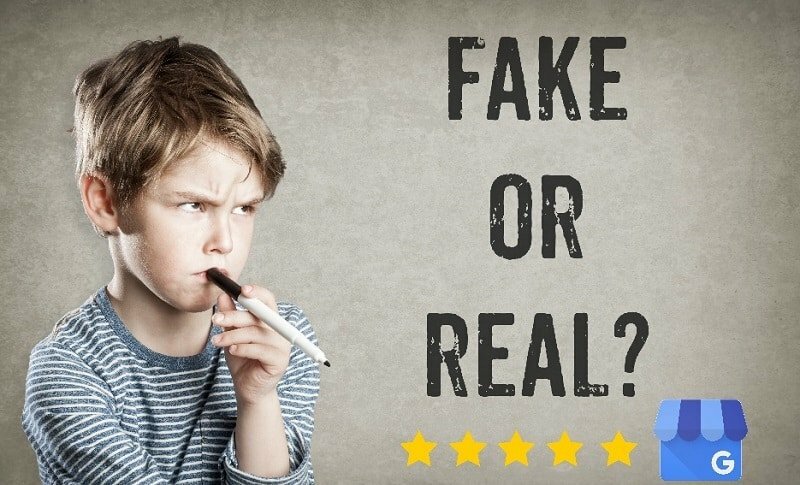 While many Americans watched Football last weekend, I was watching tons of “fake” ratings pollute Google Reviews with bogus 4-star ratings. If I told you over 2 million ratings were executed by less than 30 profiles, would you be shocked? What if I told you they are still live and didn’t get auto-flagged by Google? Oddly, after what I saw, today seems very quiet. I don’t see any response from Google, or your typical SEO guru’s leaning in. But, with so many companies affected, I can’t be the only one trying to figure out what is going on, right? If Google is too busy “fixing it” to respond, that’s fine. However, this virtual wildfire is spreading fast, and Google doesn’t seem to have it fully contained. 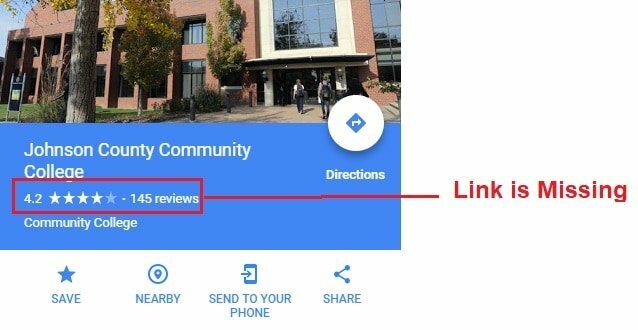 As it spreads across more local listings, Google risks credibility with people who still trust Google Reviews. 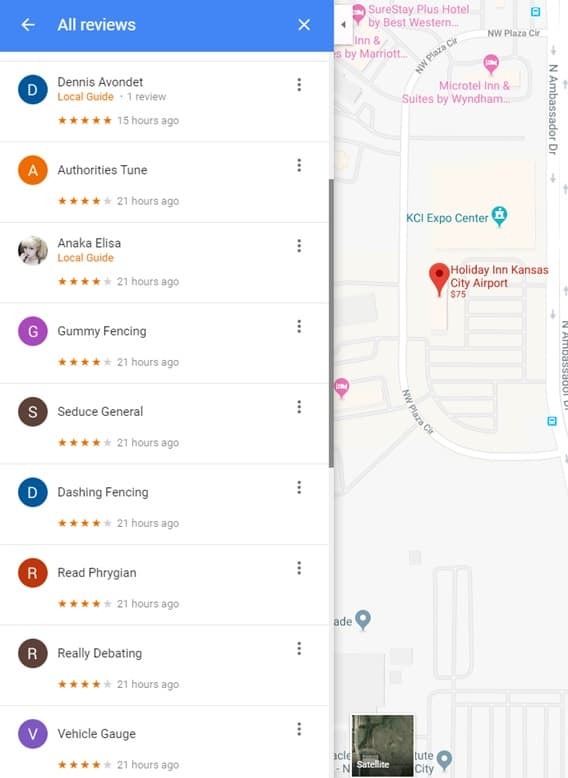 For the niche locations we reviewed below, it seems Google has removed the spam. These Google Ratings started to disappear yesterday afternoon and, for the most part, are gone. This network of Google Reviews Spammers is not stopping. They have changed names on their profiles and are passing out Google Ratings at a high enough volume to maintain their Local Guide points. For example, if you click on my Between Fencing profile I named below (#3). This “Local Guide” has uploaded a new profile photo and changed their name to: “Công Ty TNHH Sắt Mạnh Tuấn“. 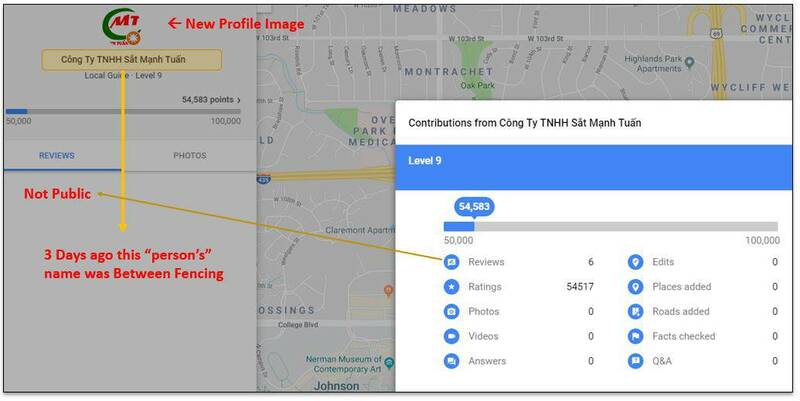 More importantly, Google has allowed them to maintain not just an account, but a level 9 Google Local Guide status with 54,583 points. 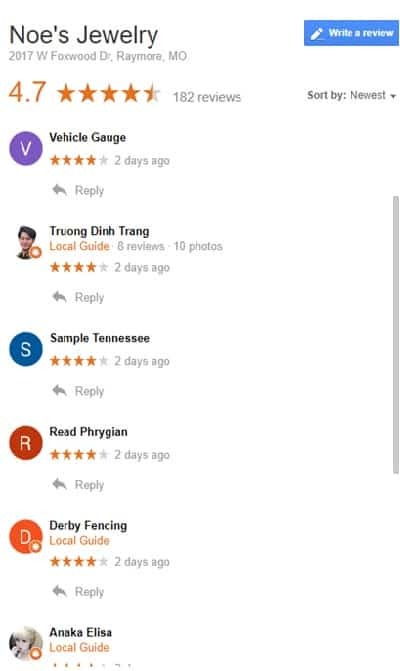 Their profile image changed, yet the 6 reviews they did make are not public. This is a shock to me, let’s hope that this is not enough to stay one step ahead of Google. Google has completely removed the link to see individual reviews from the knowledge graph on some locations. This fixes their 4x repeats issues from yesterday; however, ratings spammers are still counted and calculated as part of the overall average star rating. Google is starting to make some changes to review links in SERPS. For example, the reviews link on the knowledge graph works, but no more “recent” reviews show up when this option is selected. However, if you already responded to these new ratings, these ratings now show up 4 times in a row! 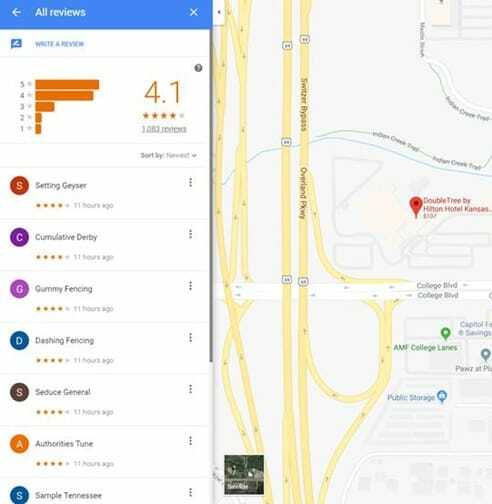 Someone’s brilliant network of Google Profiles and highly rated Local Guides blasted tens of thousands of local businesses with 4-star ratings. Let me repeat, not “reviews,” only “ratings.” Also again, not 1-star or 5-stars, just 4-star ratings. What makes this attack different than many of the other fake and paid Google Review claims of the past is the size and unsolicited nature. Most times, I can typically follow the money or motivation with regards to spam, but this is an effort unlike anything I have seen before. According to ReviewFraud.org, this issue started in late September. Furthermore, their research uncovered that 27 profiles had executed 2,370,000 ratings. This is an average of 64,000 ratings per profile, and we can see they range from around 50,000 to 100,000 ratings per profile. 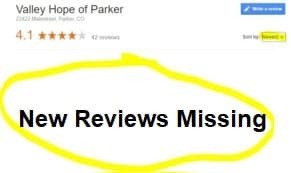 Who’s Getting Google Review SPAM? The “attack” seemed to be geared toward local businesses that already have plenty of reviews. This includes hotels, colleges, movie theaters, jewelry stores, golf courses, and many others I don’t have time to cover in this article. 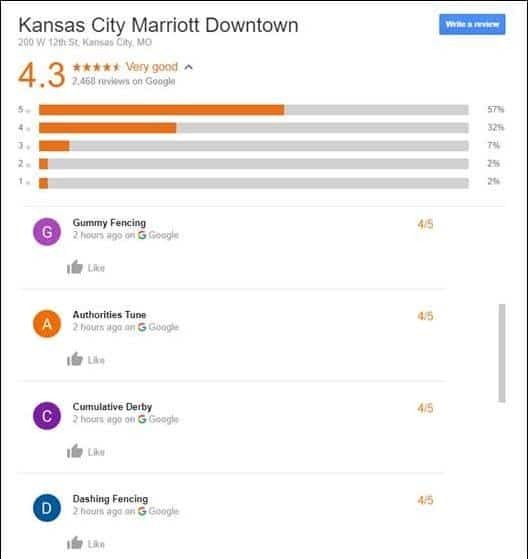 I live in Kansas City, and as an agency owner, I have more than a few GMB accounts to monitor. Thus, I can say with some confidence it was Kansas City’s weekend to get hit by this group. Perhaps the West Coast is busy putting out real wildfires but locally we have a virtual Google ratings wildfire that is out of control. I would love for more people to share their story in the comments below. Who Are these Google Review Spammers? The quick answer is that I don’t really know. 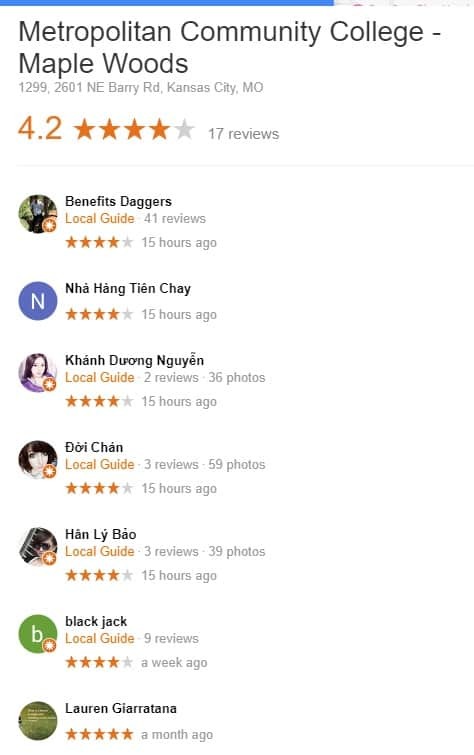 This network is smart, and their privacy settings are locked (thanks Google), so no one can see much about these “people.” Trust me, the irony between Google touting their love of privacy and it being the very thing that is killing their Google reviews transparency is not lost on me. 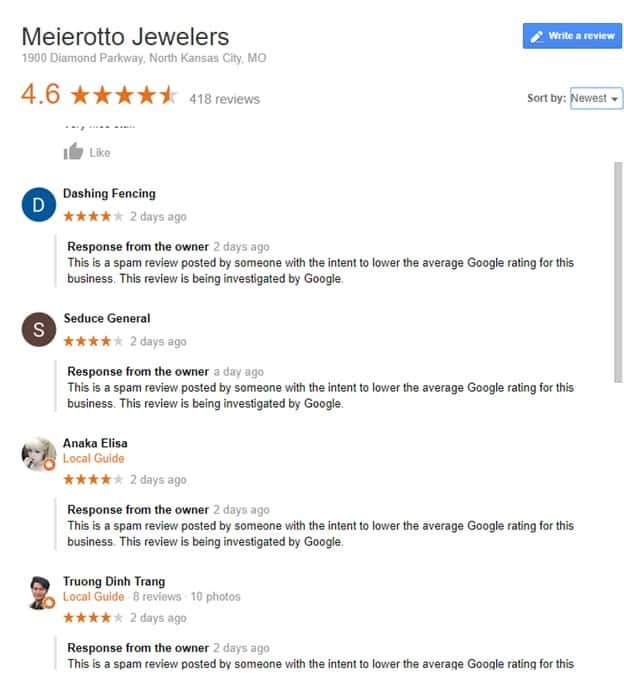 To say that it looks bad on Google when they ask for business owners for trust on their Google Reviews, but then something like this can happen without a quick resolution is an understatement. 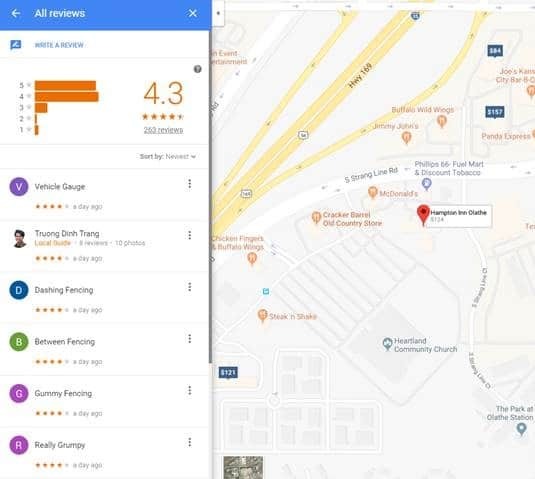 Furthermore, it begs the question to Google, why have the “Ratings” count and the “Reviews” tab under Local Guide profiles if you are going to allow them to block their reviews from public view? It seems silly, and it’s been obviously exploited by this group as a loophole for spam tactics while remaining covert about their online review behavior. Counter to their profile view, you can see my Local Guides account is very transparent. Google shows my reviews publicly, and my account shows that I add images, answer questions, suggest edits, etc.—basically, I look human! I’m honestly shocked that the Google algorithm is not smart enough to catch something that seems this rigged. The motivation for someone to do this is also lost on me. Google may invite you out to Mountain View for a Local Guides Summit if you reach a certain level, but I’m pretty sure they are not sending out iPads or gifts that would make fake Local Guide achievements worth the effort. If I’m wrong, please let me know in the comments section. According to my research, I found these 36 profiles consistent with massive amounts of Google Review Spam. Some of these profiles appear more real than others, and I was unable to track anything back to a parent company or brand that could be behind this. Furthermore, the consolidated list makes me think this is not a Mechanical Turk job, and the volume behind their ratings makes me also think this is not a Fiverr or UpWork situation. To me, these feel like someone just created a network of profiles to do this because they could. That might be the scariest thing! 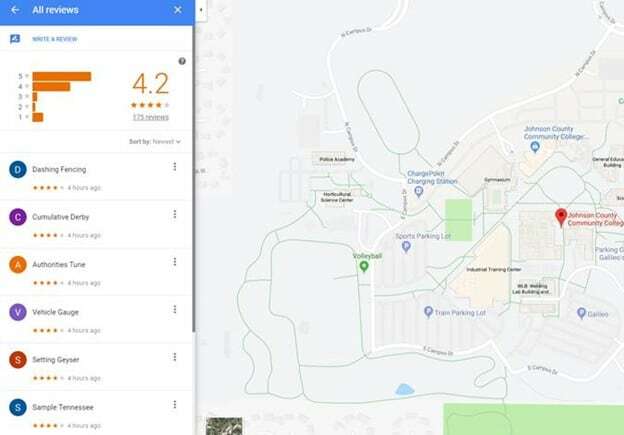 What’s Wrong with the Google Reviews Support and Flag System? In my escalation to Google Support, their boilerplate response was to flag and identify which review I thought was fake… Yes, pick one at a time. As you can see above, my research backchanneled an entire network, found several examples, and yet, Google still wanted me to talk to them in terms of one review at a time. 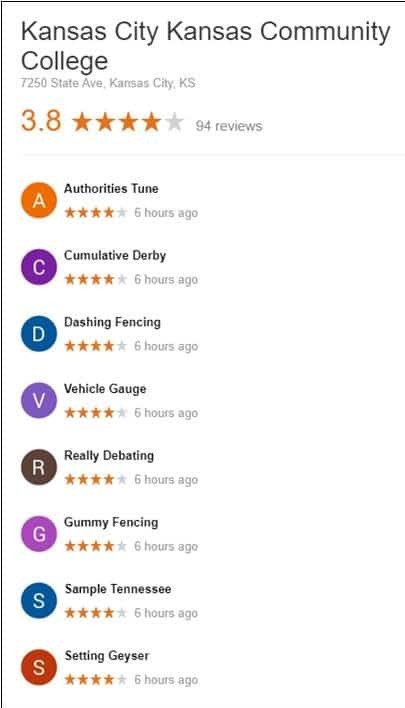 If Google holds the status quo of being the only judge, jury, and police on all matters related to Google Reviews, it’s likely going to die the slow death of community distrust and lack of transparency. Google should also admit that flagging reviews for feedback is not scalable for them, or business owners. For Google, spam creates an influx in support tickets to solve and creates a growing queue of work for their team to work thru while local businesses suffer and complain. For business owners, flagging each review one at a time when bulk spam hits your listing is frustrating and time-consuming. Crowdsourcing does not seem to be on the radar for Google Reviews beyond simple feedback. The time I spent researching and documenting all these issues Google missed, I could have been helping them fix online data and making the internet a better place. Unfortunately, they seem scared of anything beyond feedback at this time and continue to insist on their teams and their algorithms. I’m wondering if a more open “Wikipedia style” of edits and approvals would be better than the status quo. 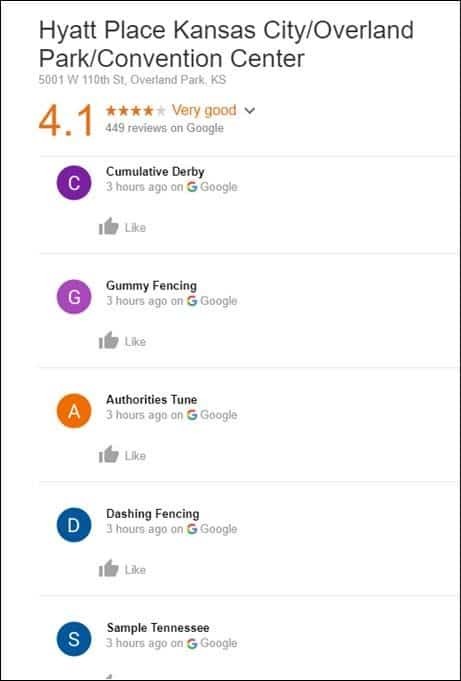 Of course, Google moderators could still oversee and lock things down as needed, but it might be better for all if Google Reviews had a community that could help police itself. I would love to hear anyone’s thoughts on this as I’m not able to find much on Moz or SEJ about this topic. We were hit on Dec 1st and 2nd with 22 of these profiles. An additional profile that wasn’t included on the list was “Authorities Tune”. As of Dec 4th it looks like we only have 1 left that hasn’t been removed.